Doing “cold” math calculations and regulating “hot” emotions may seem like pretty unrelated cognitive abilities, but both tasks depend on our capacity to manipulate and update information. Researchers have long speculated that the two abilities might be connected and new findings are providing some evidence for the link. According to data from a brain imaging study conducted at Duke University, students who had relatively greater activity in a specific area of the prefrontal cortex while completing mental math exercises also reported more robust emotion regulation skills compared with their peers. The findings are published in Clinical Psychological Science. “Our work provides the first direct evidence that the ability to regulate emotions like fear and anger reflects the brain’s ability to make numerical calculations in real time,” study first author Matthew Scult said in a statement from Duke University. Scult is a neuroscience graduate student in the lab of the study’s senior investigator Ahmad Hariri, a professor of psychology and neuroscience at Duke. The researchers used functional MRI to measure the brain activity of 186 undergraduate students while they completed math problems from memory; the participants also completed questionnaires and interviews assessing their mental health status and emotional coping strategies. Memory-based math problems engage a region of the frontal lobe called the dorsolateral prefrontal cortex and studies have shown that relatively greater activity in this area is associated with fewer symptoms of anxiety and depression. 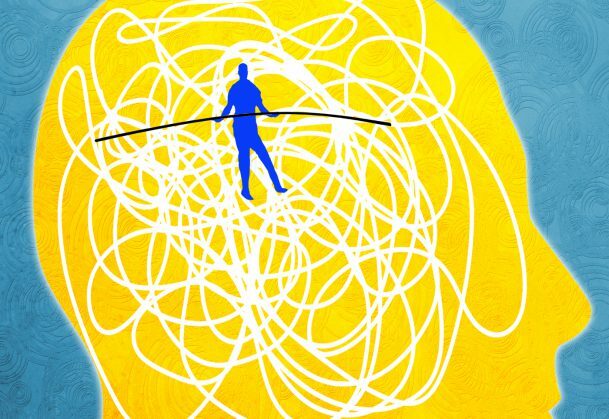 A well-established psychological intervention called cognitive behavioral therapy, which teaches individuals how to re-think negative situations, has also been shown to boost activity in the dorsolateral prefrontal cortex. Scult, Hariri, and colleagues found that the more active a student’s dorsolateral prefrontal cortex was while performing mental math, the more likely he or she was to report being able to adapt thoughts about emotionally difficult situations. Furthermore, greater activity in the dorsolateral prefrontal cortex was associated with fewer depression and anxiety symptoms. The difference was especially obvious in people who had been through recent life stressors, such as failing a class. Participants with higher dorsolateral prefrontal activity were also less likely to have a mental illness diagnosis. The researchers suggest that increased activity in the dorsolateral prefrontal cortex may enable people to think about complex emotional situations in different ways, facilitating flexible emotion regulation strategies. Although these findings indicate a connection, it’s still unclear whether more actively engaging the dorsolateral prefrontal cortex leads to better emotional coping strategies or the other way around. Collecting data over time will allow researchers to examine whether one factor precedes the other, helping to shed light on the direction of causality. “We hope, with these and future studies, that we can inform new strategies to help people regulate their emotions, and to prevent symptoms of anxiety and depression from developing in the first place,” Scult said.